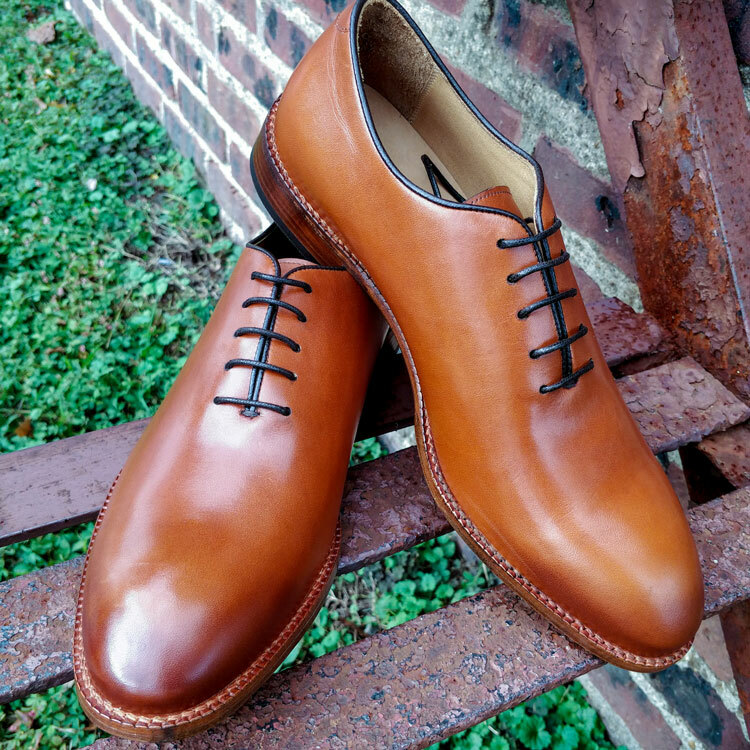 After a lengthy love affair with Allen Edmonds’ Strandmok brogues, I yearned to sample more from the prestigious American firm. With my penchant for the rustic elegance offered only by brogues, I wanted more of the same. However, I also wanted something black that would be more more appropriate for wearing in towns and cities. Nevertheless, with France experiencing floods and snow storms hitting anywhere north of Lyon, they needed to be hardy and robust. Fortunately, Allen Edmonds has a plethora of offerings to choose from. 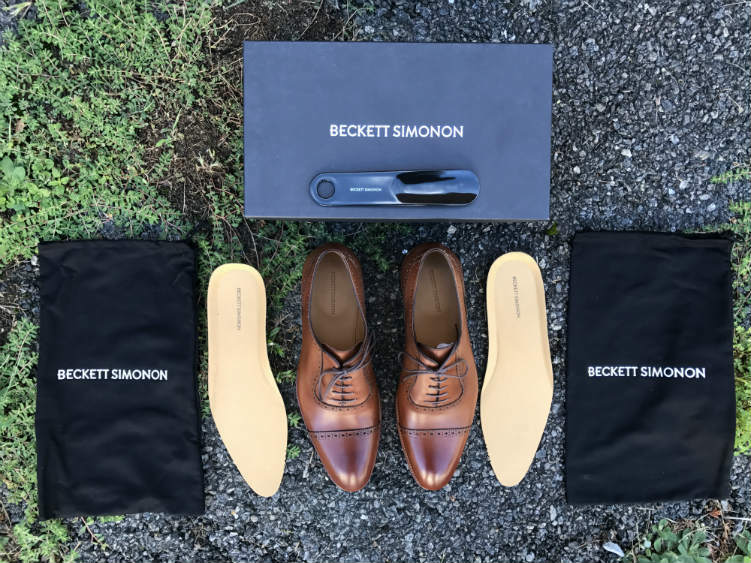 Scrolling through the options with Bespoke Unit founder Paul Anthony, my heart skipped a beat at the sight of the Dalton Wingtip Dress Boots. 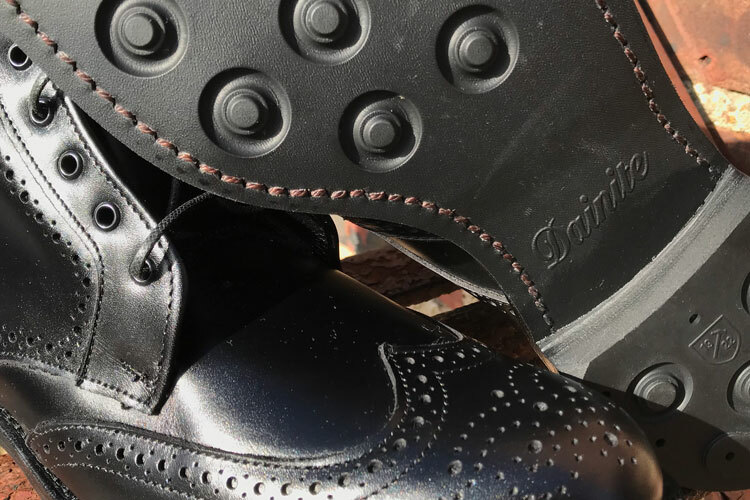 Not only were these brogue wingtips but they came with the iconic Dainite soles, which I loved on the Strandmok. Also available in walnut, I jumped for the black option so I would have a little variety. The combination of these elements would be perfect for fulfilling my needs. On one hand, the boot form with Dainite soles would stand up to any natural disaster. 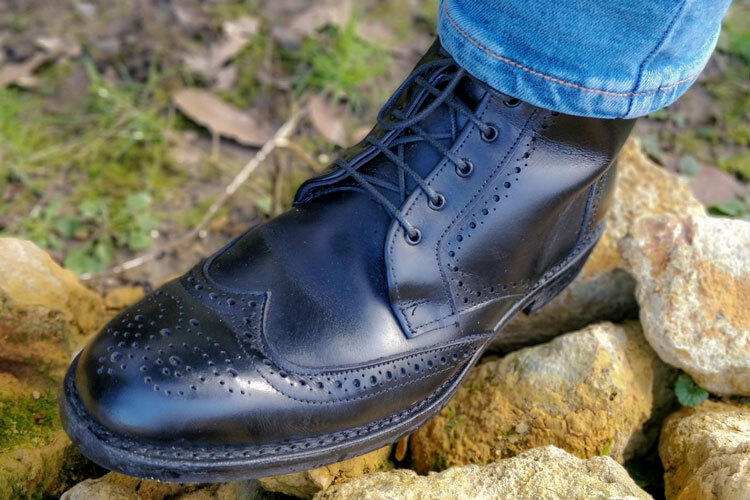 Meanwhile, the smooth black leather and brogue details offered the elegance that I sought. The overall result was robust yet graceful footwear for a dignified appearance. Those that follow my sporadic on Instagram know that I’m something of a vintage enthusiast. However, I tend to curb this on a daily basis when bouncing around in my Brie country home. Nevertheless, I do like to think that I have discerning taste and seek to retain that old world verve even in my usual attire. Therefore, a solidly-built boot would be ideal when wandering between the muddy fields and paved streets of Paris. Thankfully, Allen Edmonds’ Dalton wingtip dress boots didn’t disappoint in any environment. Once out of the box, it was hard not to admire the superior craftsmanship involved for making these fine boots. Despite the usually rugged boot styled perpetuated by hipsters, these boots were just as elegant as any dress shoe. With a full toe and extended calf-high upper, the shape offers the ideal balance between shoes ideal for both the office and the streets. 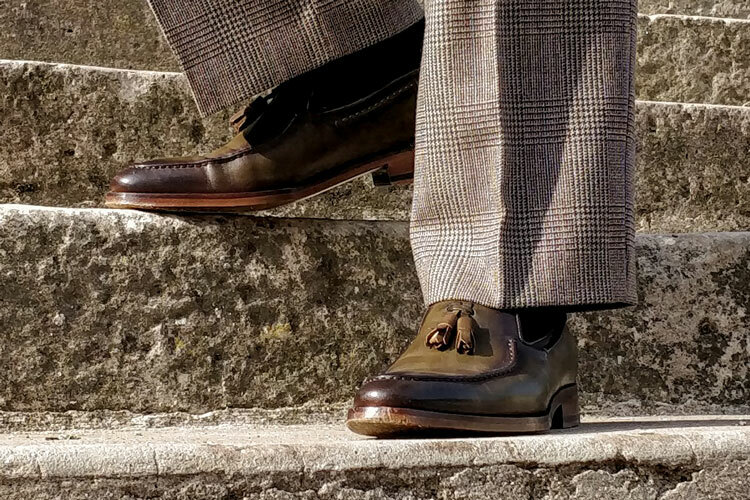 The brogue design of the toe medallion showed an intrinsic attention to detail without becoming overbearing. Similarly, the perforations or “perfing” across the boot’s edges added the ideal blend of motif and sleekness. However, Allen Edmonds omitted using the decorative saw-toothed edges known as “pinking” for a more urban and less rustic look. Want to discover more about what these are? Head to our shoe anatomy page to learn more! 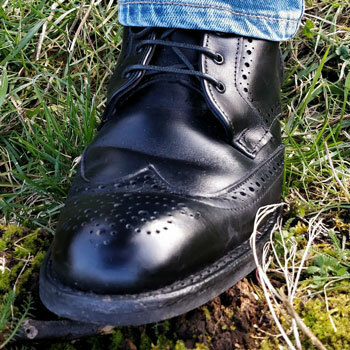 In fact, the above details make this something of a wingtip and brogue hybrid. 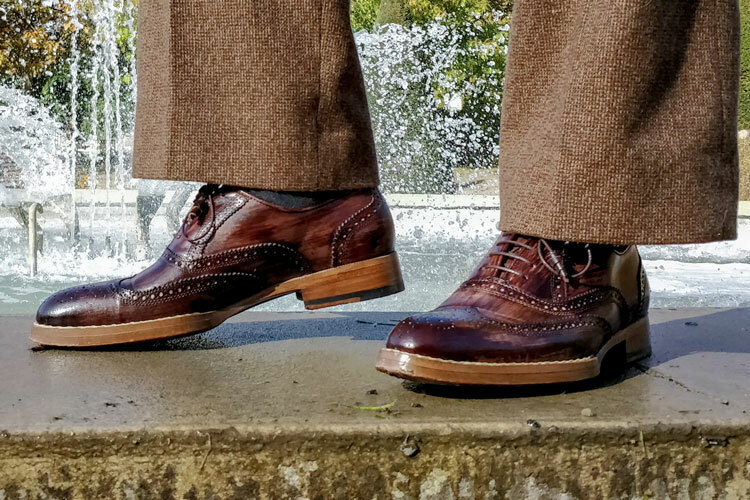 As our guide to wingtips explains, the lack of pinking is a characteristic of these, which are sometimes referred to as “austerity brogues”. Meanwhile, the perforations are as you’d expect from the full brogue. Finally, the orange stitching found on the Dainite sole as well as the matching lining was a wonderful touch for a mild pop of colour. Like the outside, the leather is made from a premium calfskin that’s soft and supple in all the right areas. For the true shoe enthusiasts out there, you’ll be delighted to know that this premium boot is also made with a 360° Goodyear welt. 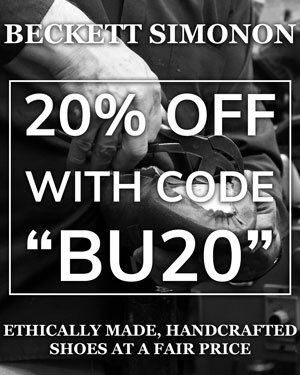 This labour-intensive technique offers unparalleled durability and the possibility of regularly resoling the shoe during its lifetime. However, the Dainite sole is such a sturdy and robust addition that it would be hard to imagine that this will be needed. Personally, I used to prefer leather soles for their authenticity. Yet having now tried two pairs of shoes from Allen Edmonds, you can consider me converted! With their extra grip and durability, I’ll be staying firmly on the ground with fewer trips to the cobbler. I’m also quite fond of the particular Last used to make this shoe. The Last is effectively the wooden moulds that are used for determining the shoe’s final shape. In this case, Allen Edmonds used their in-house 42 Last, which offers a lovely almond toe shape and a sleek arch profile. As will be covered later, the reinforced pull tab was a blessing too and gave the strength needed to slip the boots right out no matter the resistance. Being a premium company, Allen Edmonds offer their shoes in a number of widths as well as standard sizes. Therefore, you can choose a better fit according to your needs. Myself, my requirements are quite average. Therefore, I tend to pick the standard “D” option that’s offered. With the Strandmok brogues, these were a perfect fit. However, the fit was a little tighter with the Dalton boots over the ankle. Given that the boots are fitted much higher, this was likely an oversight on my part. Perhaps I have cankles? Fortunately, this wasn’t much a problem as the supple black leather gave quite nicely after a few hours of wearing in. Furthermore, the strengthened pull tab made them easy to slip on without worrying about damaging the boot. Eventually, the boots were a perfect fit and very comfortable to wear. The moral of the story is just to remember to take your ankles and calves into consideration when choosing your size. First tested out in the frosty streets of Geneva, the boots were like slippers against the ice-cold tarmac. The supple leather glistened under the incandescent street lamps as we strolled along the world-famous river bank. Paired with a simple pair of chinos and raincoat, they beautifully fulfilled their role for a generally business casual appearance. After a quick polish, I placed the boots back into the fabrics bags that came with them for future use. Fast forward a few days and they would later be adorned for flooded and snow-laden Paris. 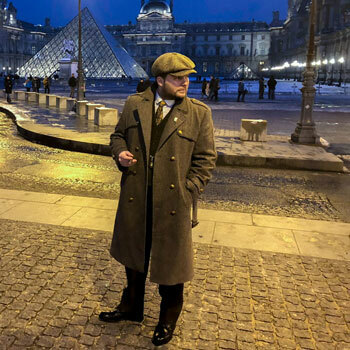 Paired with a three-piece suit, vintage overcoat and bakerboy cap, they were the perfect finishing touch. Although far from a post-apocalyptic setting, the Parisian streets were paved with ice and quite dangerous to walk on. Fortunately, the Dalton’s hardy Dainite soles were there to regularly save me from both injury and embarrassment! Upon returning to my home village, they were again worn casually on a few errands. Despite the mud and gritty road salt, the supple calfskin leather polished out beautifully with barely a scratch. They’ve received many compliments and I’ll be looking forward to brandishing them on my next trips into town! It’s hard to find a drawback for these boots. Although the fit was on the tight side for me, Allen Edmonds’ do offer exchanges for such matters. As for the boots themselves, their tough and durable construction means that they’ll accompany you in almost any weather conditions. However, they’re by no means exclusive to harsh weather and would be ideal even during spring or early autumn. 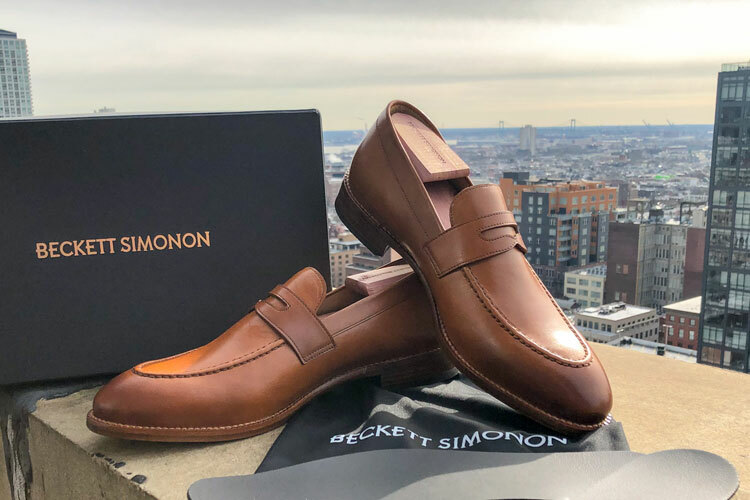 Thanks to their thoughtful design, they’re versatile footwear that can be paired with almost any occasion throughout the year. 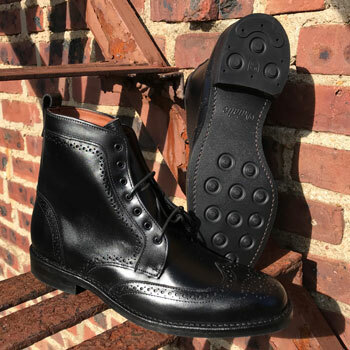 If you’re like me and love boots but prefer to retain a certain air of elegance, the Allen Edmonds Dalton wingtip boots are the ideal choice. Here, you’ll have something that could accompany from even the most formal occasions all the way down to rambling through muddy fields! Reviewed by Charles-Philippe Bowles, on 21 February 2018 . "Great for stormy days around town. When trudging around the city in poor weather conditions, the Daltons are ideal when attending both formal and casual occasions." I got the AE Dalton in burnished dark chilli about a month ago (March 2018) and love ’em! The dark chilli color is even more gorgeous in person, and I’ve found everything written in this article to match my experience with the AE Daltons. Thanks for your comments and I’m delighted to learn that the review is in line with your experiences. I love my Daltons too and think it’d be great to have them in brown as well. The dark chilli sounds lovely and I may consider it as an alternative. However, I also love my Strandmok brogues by Allen Edmonds so I wouldn’t want to neglect them either! Have you tried Paul Evans NY yet? 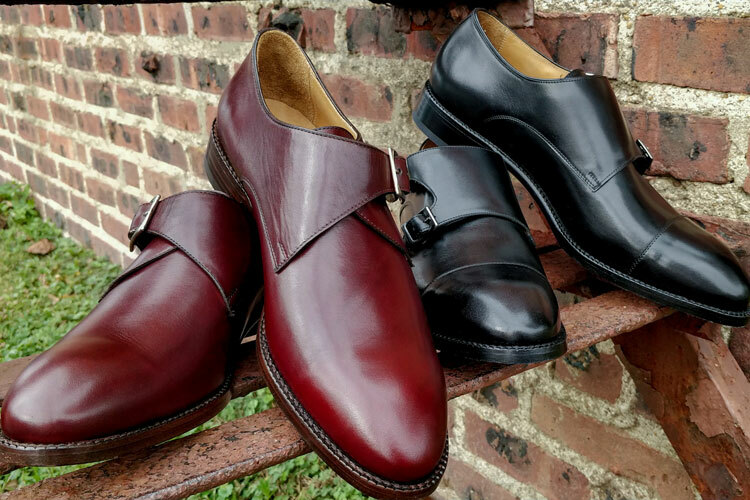 Handmade in Naples, Italy from the finest Italian calfskin leather and painted by hand. Not yet, but they are on the hit list!